Free Opening Reception: Thursday, October 9 @ 6:30 p.m. – 8:30 p.m. Working Method Contemporary is pleased to announce the opening of In the Making, an all media exhibition featuring 17 Master of Fine Arts candidates in Studio Art at Florida State University. The exhibition is curated by the Florida State University League of Graduate Artists and will be on view from October 9th until October 31st, with an opening reception on Thursday, October 9th, 2014 from 6:30 p.m. – 8:30 p.m. The reception is free and open to the public. This inaugural show is for the fall semester of 2014 in WMC’s new location at the Carnaghi Arts Building, and it is meant to present these artists’ new works from the studio. The stipulation for all pieces, initiatives and performances is that all work must have been made this year and be new to the creator to the point that the piece is perhaps still in progress both aesthetically, conceptually or both. The pieces exhibited by these 17 artists from the MFA program reveal a sample of the broad range of artistic practices taking place at the graduate level at FSU. The disciplines featured in this exhibition run the gamut of photography, painting, drawing, ceramics, sculpture, installation, social practice/dialogical art, live and documented performances as well as an interdisciplinary approach to mediums outside of their conventional field. In conjunction with WMC, the Phyllis Straus Gallery for the Bachelor of Fine Arts students at Florida State University, also located in the Carnaghi Arts Building, will have an opening of a new show titled First and Last on view the same night with recent work from the BFA students of FSU’s Visual Arts program. Parking is located in front of the Carnaghi Arts Building and in a second lot by the adjacent baseball field. 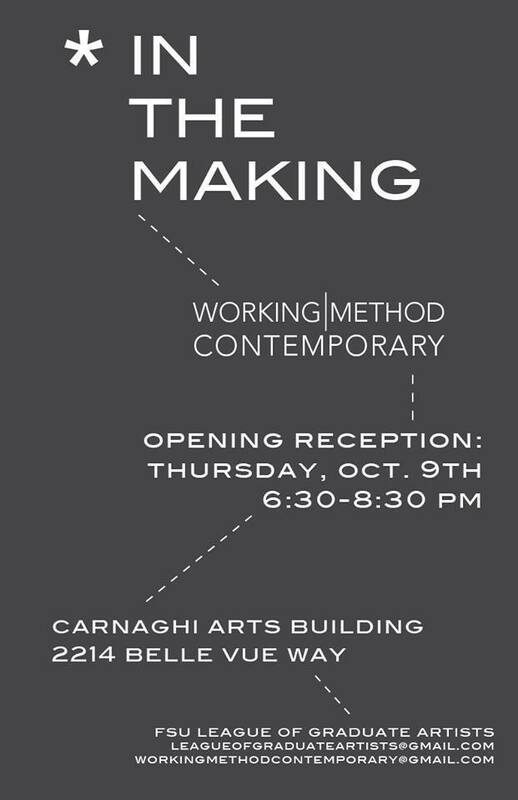 For more information, please contact WorkingMethodContemporary@gmail.com or view their Facebook page.